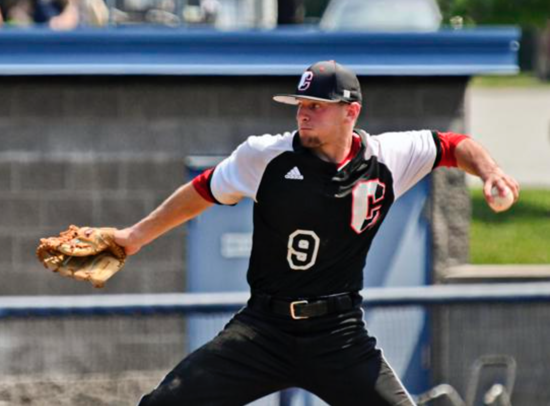 PCL Baseball – Archbishop Carroll was coming off a loss that several players – both on and off the record – described as a combination of disappointing and embarrassing. After losing, 13-5, to Bonner-Prendergast in front of their home crowd on April 8, the Patriots rebounded for a 2-0 win at Neumann-Goretti 48 hours later. Senior Tyler Kehoe hurled a two-hit, complete-game shutout. Talk about a feel-good victory. Cornell struggled against Bonner-Prendergast; then again, most pitchers do against the first-place Friars. Still, Cornell was relieved when the Pats regained their stride. “I had a rough outing on Monday, and Tyler picking me up on Wednesday is exactly what the team needed,” said Cornell. Kehoe’s tremendous pitching appeared to not be enough. The Patriots were unable to solve N-G starter through five innings. In the sixth, however, junior Pat Marley walked and raced home on a hit-and-run, RBI double by senior Jack Tulskie. Sophomore Evan Bruder followed with a single down the line that scored Tulskie with an insurance tally. Kehoe was pressed to elaborate on his two-hit masterpiece. He did; well, sort of. Through a little less than one third of the league season, Carroll is tied with five other squads at 3-1. Among them is Father Judge. On April 8 against yet another 3-1 team, Archbishop Wood, Judge scored three runs in the second to take a 4-2 lead and held on for a 5-3 triumph. Junior Shawn LeVan doubled twice and notched an RBI, and junior Ethan Martini drove home two more for the Crusaders. The combined pitching of senior Sean Moran and junior Bryce White held the Vikings to six hits. In a 10-0 victory over visiting Devon Prep the next day, LeVan joined junior teammates Justin Barcowski and Eddie Doll with multiple hits while seniors Matt Kennedy and Matt Konan combined for a six-inning shutout. Senior Andrew Sicinski, who contributed a sacrifice fly against Wood and a grand slam – his second of the season – against Devon Prep, credited Judge’s youth for the Wood win. “Our young guys stepped up,” he said. As to his grand slam, Sicinski crushed a curveball to finish a seven-pitch at bat in epic style. At 4-0, Bonner-Prendergast has toppled St. Joseph’s Prep, Father Judge, Archbishop Carroll, and Conwell-Egan by a composite total 35-12. Senior Steve DiBattista, who notched the pitching win over Conwell-Egan, echoed his teammate.